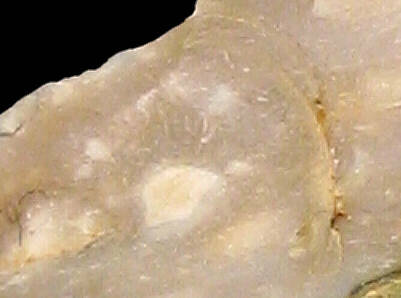 Material (geologic): Redeposited Late Cretaceous (Campanian) flint from Miocene sediments. Mode of occurrence: Ovoid pebbles and cobbles (En Lachat), rare fragments of tabular flint (Champ Bottu). Cortex: Rolled neo-cortex, smooth and thin (<1 mm), grey (En Lachat); thin pitted neo-cortex, stained dark brown-grey (Champ Bottu); transition always sharp. Colour: Light brownish grey (2.5Y 6/2 to 5/2) with dark grey patches (N4) at En Lachat, yellowish brown to brownish yellow (10YR 5.5/6) at Champ Bottu. Pattern: Spotted (grain aggregates surrounded by recrystallization haloes). Appearance: Homogeneous material with a medium lustre, subtranslucent, smooth, fine-grained. Structure: Some samples display a fluidal arrangement of grains. Grains: 20 to 25 %, very small pale rounded elements (50-80 µ), occasionally agglomerated, skeletal grains with high sphericity contained between 125 and 300 µ. Grain composition: Fragments of thin-walled sponge spicules, small globose planktonic foraminifera, rare small biserial foraminifera (Heterohelicidae), several discrete punctated spheres of 250 µ. 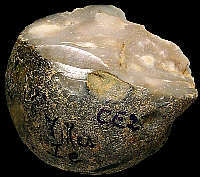 Other types of flint: The flint here constitutes quite a mixed lot, with predominantly Late Cretaceous material like CE1a, CE1b, CE1c, CE3, CE4a, CE4b, and CE5, but also Hauterivian (Early Cretaceous) material of the Ht3-type.